Antique pickers Sherri Green and her bff, lovable town gossip Carol O’Brien, search for treasure amid the trash in their small midwestern town of Paradise. What they find is more than they bargained for. When they score a box of antique vases at a local auction in nearby Round Bottom, it sets off a chain of events that makes a competing picker see red. But that’s not the worst of it. Someone in the tight-knit picking community ends up dead. Can Sherri and Carol discover the murderer from a treasure trove of suspects before the crime gets buried along with the the town's most hated victim? Picked to Death is a clean, short read. It’s perfect for lovers of cozy mysteries that feature an amateur sleuth. 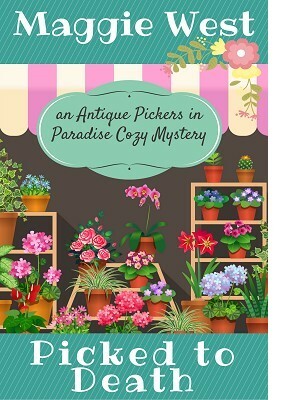 Be sure to check out book 2 in the Antique Pickers in Paradise cozy mystery series, Cotton Picking Murder. More small town fun and crime solving in the close-knit community of Paradise.